DIVERGENT meets MEMOIRS OF A GEISHA in this dark YA thriller set within the walls of a lawless slum city, where Jin Ling searches for her lost sister and Dai struggles to complete an impossible mission. There are three rules of survival in the Walled City: Run fast. Trust no one. Always carry your knife. Right now, my life depends completely on the first. Jin Ling hides under the radar, evading the street gangs as she searches for her lost sister. Mei Yee survives trapped in a brothel, dreaming of escape while watching the girls who try fail and die. Damaged and betrayed, can these three find the faith to join forces and escape the stifling city walls? With a fantasy setting inspired by Kowloon Walled City, Hong Kong, Ryan's novel has a rich authenticity and an intense atmosphere, and its pace will enthral the reader from the very first page. "Readers, rapt, will duck for cover until the very last page." ""Kirkus Reviews"""
"[A] gripping and gritty thriller...Graudin deftly juggles the multiple perspectives to create a riveting, suspenseful tale of violence, danger, and survival." ""The Horn Book"""
"In spite of the fact that the descriptions are often of horrific things, they are lyrically crafted, painting vivid snapshot images of what might lead people to make unimaginable choices...a sharp, compelling novel." ""The Bulletin"""
"Graudin is gifted at employing simile and other literary devices to describe the gritty surroundings and Hak Nam's criminal inhabitants...The result is three stories deftly entwined into a fast-paced, striking tale." ""Publishers Weekly"""
""The Walled City" is dark and grim and intensely compelling. It is a book you cannot easily forget, a book you will want to read again and again." "Ellen Oh, author of "Prophecy"""
"This dark and gritty thriller doesn't pull any punches, taking readers into a world of fear, danger, and deprivation." ""School Library Journal"""
"[Graudin] artfully balances tense action scenes with lyrical language, distinct voices for each narrator, and ruminations that probe the book's deeper themes of family, regret, and second chances." ""Booklist"""
""The Walled City" grabbed me by the throat from page one. From the very first chapter to the last, my heart loved and feared for these characters. Brilliantly and beautifully written--a true triumph." "Beth Revis, "New York Times" bestselling author of the Across the Universe series""
DIVERGENT meets MEMOIRS OF A GEISHA in this dark YA thriller set within the walls of a lawless slum city where Jin Ling searches for her lost sister and Dai struggles to complete an impossible mission. The book was a pretty good read but was ruined for me at the end when the author said it was based on a real walled city. The author did not manage reflect the real city in his writing and should have kept his story as a complete work of fiction. 5.0 out of 5 starsIts confusing at first but keep with it! This is one of my favorite books. I was on edge to start reading it because the synopsis didn't catch my interest but i decided to give it a go and it was awesome. Loved the book. Too bad I’ve read all her books already. Hopefully she will keep them coming. 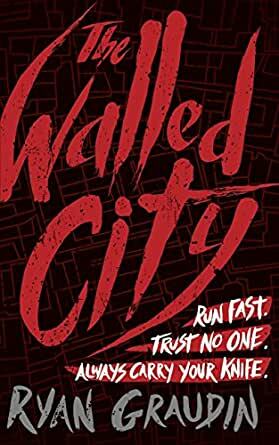 I don't know what I was expecting from The Walled City but this book exceeded my expectations! In The Walled City, we follow three POVs, a girl pretending to be a boy while on a mission to rescue her sister, a boy with 18 days to complete a mission, and a girl imprisoned in a brothel these two both find themselves in on their missions. I loved all of their POVs. For a moment there, it was hard to keep the three straight but their journeys are all so different and distinct, it soon becomes very clear where each of them are on those journeys and how they all connect. I loved all three perspectives, I felt very grounded in each one and I really enjoyed seeing the different dynamics each person had with the people around them, relationships that often helped them live to see the next day. The setting is China which was wonderfully brought to life by Graudin. Round of applause for her research here because it shows and pays off so well. The setting of this walled city, ruled by drugs and human trafficking, is actually based on the real life Kowloon Walled City which astounded me because I didn't even know about Kowloon. Talk about danger and mystery. This is not an easy book to read as it's set in a very dark and disturbing setting where the stakes are very high and the tension is so thick, your heart will race. You will root for these characters to stay afloat in a city where everyone seemingly drowns. There's plenty of action in this novel but there are also very poignant moments and the balance in tone here is beautiful. I really enjoyed it all. If you're looking for a pick me up book, The Walled City is the exact opposite of that. You have to have thick skin to read this book. It's not an easy one to get through simply because of the subject matter at hand. But the characters. They fight. They fight to survive and they fight to tear down the walls in their lives and seeing that fight is worth every single minute. I knew that I'd like this book but I didn't know I'd enjoy it as much as I did and I'm so happy to say that this one really surprised me in the best way. I loved how the story unraveled and came together and I think Graudin is a fabulous storyteller and writer. Definitely give The Walled City a read if you're looking for a really intense stand alone novel. I really enjoyed this book! It was a quick read. The ending was happy but a little far fetched. Compelling read. Great mix of YA action and historical details. That said, some of the action would definitely be a very hard PG13 and I would advise parents to preview the novel to determine if it is age appropriate for their child[ren].